Are you looking for an alternative to a career path at a big firm? Does founding your own start-up seem too risky? There is a radical third path open to you: You can buy a small business and run it as CEO. 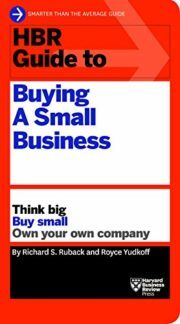 Purchasing a small company offers significant financial rewards―as well as personal and professional fulfillment. Leading a firm means you can be your own boss, put your executive skills to work, fashion a company environment that meets your own needs, and profit directly from your success.